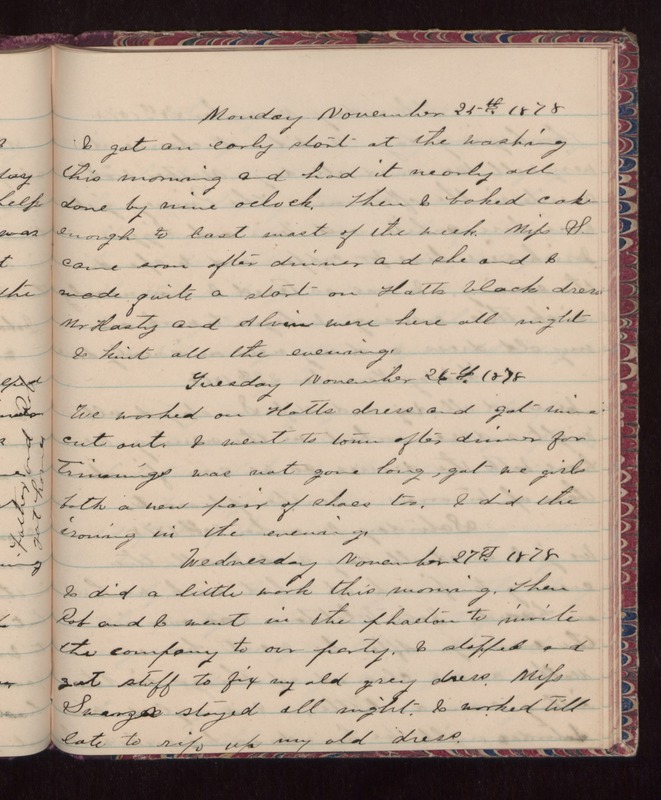 Monday November 25th 1878 I got an early start at the washing this morning and had it nearly all done by nine oclock. Then I baked cake enough to last most of the week. Mifs S. came soon after dinner and she and I made quite a start on Hatts black dress. Mr Hasty and Alvin were here all night. I knit all the evening. Tuesday November 26th 1878 We worked on Hatts dress and got mine cut out. I went to town after dinner for trimmings was not gone long, got we girls both a new pair of shoes too. I did the ironing in the evening. Wednesday November 27th 1878 I did a little work this morning. Then Rob and I went in the phaeton to invite the company to our party. I stopped and got stuff to fix my old grey dress. Mifs [Swanzse?] stayed all night. I worked till late to rip up my old dress.